My main character of the weekend, Color of Reverence. No points for seeing a theme here. Me, I am not a saint (except in the most generic sense, as synonym for God’s people, if even that.) Nor am I a hero, but I play one on the Internet. And that’s where I made my mistake, which I think may be instructive for others too. 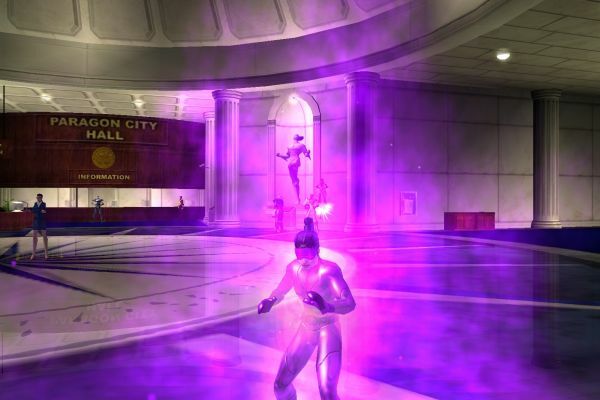 I joined the online superhero game City of Heroes during its closed beta, a great honor in my view, and played it probably literally every week for about 7 years. Usually more than once a week too. No exception for vacations (but then I don’t actually travel during my vacations, I write). It is only the last year or perhaps even less that the game has begun to gradually fade from my life, like so many other things do eventually. It is a good game, too. I don’t mean just in value of production, but in production of value. You take on the role of a hero with slightly superhuman powers, and defeat criminals, protect the innocent (and sometimes the not quite innocent, when they need it) and gradually grow more powerful and famous over the course of this practice. So it kind of reinforces traditional values. In the words of one of the scripted bystanders on the streets of Paragon City: “Forget those postmodernist deconstructionists! Itland is a real hero, plain and simple.” OK, the “simple” part may not be my favorite, but still. Now as my life is moving toward its final exam (not that I am in the least hurry!! ), I find a little less time for gaming than I used to. And that means my visits to City of Heroes have been quite irregular and mostly short. This suits me: When I play the same game for too long, I become kind of immersed in it and it begins to invade my real life with flashback moments and such distractions. And generally a feeling of emptiness after hours of playing. I don’t want that to happen. But this weekend was double XP weekend, in which the rewards of virtue are doubled – both the experience points and the influence. So this makes it easy to make rapid progress on a character. I took advantage of this and played a lot this weekend. I did not ask myself seriously why I would want to make rapid progress in a game I now only play sporadically. It is not like I actually need to do that. The fact that there was a reward took precedence over the fact that I did not need the reward. So I ask my heart to learn from this mistake, although it would have been better to learn without mistake. At least you can learn from mine! This entry was posted in games, human mind and tagged City of Heroes by itlandm. Bookmark the permalink.